Teaching or another form of knowledge dissemination, which is related to the PhD topic when possible. PhD programmes and courses are offered at Danish universities, which all offer excellent research, library and laboratory facilities for researchers and PhD students in addition to joint partnerships with industry. 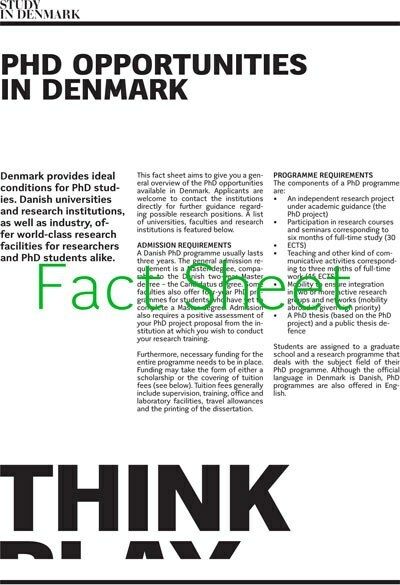 The general admission requirement for PhD programmes is that candidates should hold a degree equivalent or comparable to the Danish two-year Candidatus/Master’s degree. In some areas, a four-year PhD programme is offered to students who have completed a Bachelor’s degree as well as one year of study at postgraduate level. Studentships: PhD studentships are advertised by universities, research institutions, business enterprises and public and private foundations. Employment is usually for a period of three years. International financial support: You may also be eligible for scholarships or other international financial support either from your home country or from international organisations such as the European Commission’s research programmes. The Danish institution you enrol at may offer a scholarship programme. Please contact the institution of your interest for further information. Industrial PhD application deadlines in 2017: 20 March, until 12.00 PM. Within this deadline you can apply for subsidy for Industrial PhD Fellowships in the private sector. PhD students enrolled at a university outside Denmark can apply for admission as a visiting PhD student at a Danish university or research institution. You should contact the institution of your interest for further information on possibilities and procedures. Many universities have special application forms.